More than one-third of threatened and endangered species in the United States live only in wetlands, and nearly half use wetlands at some point in their lives. Estuarine and marine fish, shellfish, various birds, and certain mammals must have coastal wetlands to survive. CWPPRA has protected, created, or restored approximately 95,954 acres of Louisiana’s vanishing coastal wetlands in its first 25 years. Those restored swamps, marshes, and barrier islands/headlands and associated open-water habitats provide foraging, nesting, breeding, wintering, escape cover, and nursery habitat for a myriad of coastal fish and wildlife. Species that benefit include threatened, endangered, at-risk, and rare species, as well as commercially and recreationally valuable species and state and national fish and wildlife trust resources. Habitats restored through CWPPRA have aided in the delisting of our national symbol, the bald eagle, and the Louisiana state bird, the brown pelican, from the endangered species list. A well-known part of Louisiana’s culture is the state’s unique cuisine and the celebrations and gatherings which surround it. During late winter and spring, Louisiana’s state crustacean, the crawfish, is at the heart of many celebrations. The crawfish, an easily recognizable icon in Louisiana’s rich history and economy, has made an important impact on the state. The two species of crawfish harvested for commercial use are the Red Crawfish (Procambarus clarki) and White or River Crawfish (Procambarus acutus). While looking very similar, the White Crawfish has one slender and one large pincer and inhabits deeper bodies of water when compared with the Red Crawfish which has two large pincers and is commonly found in bayous, ditches, and swamps. Although the characteristic habitat location varies among the two species, most harvested boil sacks contain both Red and White Crawfish. Both species’ living environments surround wetlands and coastal regions where the aquaculture industry has skyrocketed and continues to thrive. Crawfish are important to Louisiana’s economy, and more than 7,000 people depend directly or indirectly on the crawfish industry. Crawfish provide an abundance of jobs as they are caught by fishermen, sold, processed, distributed, and shipped, and then finally make their way to customers or onto a restaurant table. Technology has advanced the methods of harvest such that crawfish farming has developed into the largest freshwater crustacean aquaculture industry in the United States. Louisiana leads the nation in crawfish production with nearly 800 commercial fishermen harvesting from wetlands like the Atchafalaya Basin and more than 1,600 farmers harvesting in some 111,000 acres of ponds. The total impact on the Louisiana economy exceeds $300 million annually, with a combined annual yield ranging from 120-150 million pounds. There are about 17,000 known threatened species in the world. Louisiana’s wetlands are a complex, fragile ecosystem of flora, fauna, and water. The swamps, marshes and bayous of Louisiana represent approximately 40% of all the wetlands in the United States. 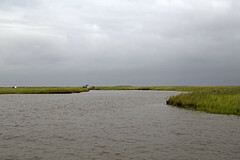 Natural disasters, such as hurricanes, in addition to pollution and other anthropogenic activities threaten the health of Louisiana’s wetlands and its inhabitants. Some of the threatened species in Louisiana include Atlantic Sturgeon, Northern Long-Eared Bat, Piping Plover, Green Sea Turtle, Loggerhead Sea Turtle, Red Knot, Louisiana Pearlshell Mussel, Alabama Heelsplitter Mussel, Earth Fruit, Ringed Map Turtle, and Gopher Tortoise. The Coastal Wetlands Planning, Protection, and Restoration Act has protected, created, or restored 95,806 aces, while also enhanced more than 351,676 acres. CWPPRA plans to continue working to help coastal wetlands and their inhabitants.